Goodman Games is doing for the post-apocalyptic genre what it did for fantasy with the Dungeon Crawl Classics RPG. 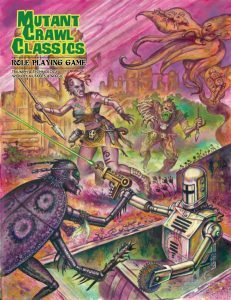 Mutant Crawl Classics, inspired by Gamma World and Metamorphosis Alpha, is stand-alone but still fully compatible with DCC. Characters can be human, mutant, manimal, or plantient and in a typical adventure venture the wastelands to collect lost super-science. For a system that’ll allow gamers to make their own mutants, Weapons Grade Funk is working toward a line of customizable anthropomorphic miniatures. The current round of fundraising will support sculpting of all the various body parts. These will then be incorporated in to an online application with which users can mix-and-match for 3D printing. Game of Blame combines be-the-first-to-dump-your-cards game-play with a kind-of hot-potato mechanic for a light card game of courtly intrigue. As the queen’s advisers, the players know that personal success isn’t really about fixing the kingdom’s problems but instead about making sure someone else takes the blame for the things that go wrong. 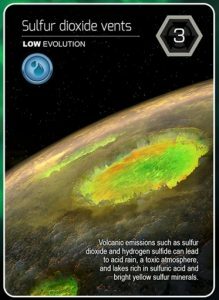 Beautiful and with a unique theme, Planetarium from Game Salute has players forming the planets of a new solar system by colliding matter on board orbits, and then further evolving those planets through the play of various cards. Back on earth, players operate ice cream trucks in Rocky Road a la Mode, Green Couch Games’ tribute to the summer season. Cards in the game serve either as music to attract customers or as frozen treats to relieve the heat. With the right customers, players can also lay claim to summer hot spots, such as the pool, park, or ball field. For the more sinister players, there’s Mr. B’s Madness at Midnight, a cultists-side Cthulhu game. This one combines worker placement and action-dice mechanics as players fulfill sinister plots and work to control key locations in Arkham. The first to 13 victory points is the winner, that is as long as they manage to keep the investigators at bay.